Kerala Veterinary and animal Sciences University (KVASU) will address policy and development issues affecting livestock production in the state to create awareness among policy makers and scientists. Media division will also address emerging trade related issues, animal welfare issues, emerging diseases of public health and geopolitical significance. It will also try to apply traditional folk arts for knowledge dissemination among the farming community and to timely intervene in social, economic, farming and other emerging issues affecting livestock production and research in the country. KVASU will help to address the development and communication issues affecting animal agriculture in the state. This will help to equip professionals to address the challenging issues affecting farming sector in the state. Directorate of Entrepreneurship, Kerala Veterinary and Animal Sciences University organized a Farm feature workshop for the Faculty members and researchers on 17th September, 2011 at Seminar Hall of College of Veterinary and Animal Sciences, Mannuthy. Editor in Charge, Karshakasree Sri. 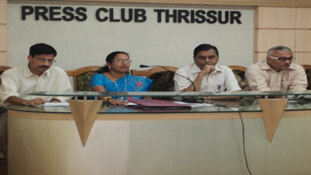 R.T.Ravivarma (Seeri) inaugurated the Workshop. Deputy Editor of Mathrubhumi Sri. M.P.Surendran launched the Farm News Services of the University. The Indian Association of Veterinary Public Health Specialists’ announced National Media Awards declared on 14th February 2012 for best reporting, Broadcast and Telecast in Public Health & food safety along with the National Entrepreneurship and quality Assurance Award. Suguna Poultry Farm received National Entrepreneurship and Quality Assurance. Radhakrishnan Naripppatta (Mathrubhumi) Davis Pynadath (Deepika), Bineesh Kottarathil (Amrita TV), Ranjith Nair (Kerala vision) Raju Pavaratty (TCV) and All India Radio, Thrissur received National Media award. Dr.H.Subramanian, Chairman, Organising Committee, Dr. C. Latha, Organising Secretary, Dr.K.P.Sreekumar Jury Chairman, Award Committee, Dr.T.P.Sethumadhavan, Convenor, Dr. B. Sunil and Dr.B.Ajith Babu (Award Committee members) attended the press conference. • Two farmer’s interactive programme telecasted under ‘krishidarsan’ programme of Doordarsan kendra, Tvm. • Participated as scientific advisory committee member for Krishi VigyanVigyana Kendra in a meeting organized by KVK Pattambi. • Documentation and telecast of 100 practices by Tvm Doordarsan-concept note prepared.